Basalt Library hosts First Wednesday Book Club at noon. Carbondale Library offers C Lab and Lunch at 2. The Red Brick Center offers After School Art Play at 2. Pitkin Library hosts After School Wednesday at 2:30. Glenwood Springs Library offers an Escape Room Challenge at 3. Basalt Library offers Kid Creators at 3 and screens The Lost City of Z at 5. Rifle Library hosts Wig Out Wednesday at 4..
New Castle Library hosts Wednesday Weavers at 4:30..
Valley View Hospital offers a breast health presentation in the Valley View Conference Center at 5. Crystal River Elementary School in Carbondale hosts Roaring Fork Schools Community Visioning, public input forum at 5:30. Aspen Chapel Gallery hosts an artist talk featuring the Man’s Best Friend Photo Exhibit at 5:30. The Burning Mountain Ukuleles perform at the New Castle Library at 6. Basalt Library hosts the Book Review Club at 6. Amy Beidleman instructs Painting People in Watercolor at the Art Base in Basalt at 6. Smokin’ Joe Kelly plays at the Snowmass Club Sage Restaurant at 6:30. Carbondale Beer Works hosts Bingo for CARE Animal Shelter at 7. Aspen Film presents the Indie Showcase screening The Bookshop at the Isis Theater at 7:30. And The Crystal Theater shows Colette at 7:30. 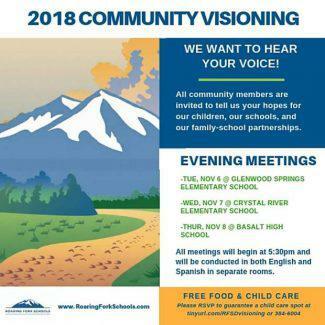 The last Roaring Fork Schools Community Visioning, public input event takes place at Basalt High School at 5:30 tomorrow night. And Steve’s Guitars presents An Evening with Steve Shindell at 8:30 tomorrow night. You can submit your calendar items on our website or by emailing calendar@kdnk.org.